My mom and I were strolling down 49th Street in Manhattan when we were suddenly overcome by the smell of freshly baked chocolate chip cookies. It didn’t even take nanosecond to figure out where the smell was coming from, because we looked up and saw cookies cooling in the window of the delightful Donna Bell’s Bake Shop. This shop was opened by Pauly Perrette of TV’s NCIS and her friends using mother’s name and recipes. So of course we had to go in and sample for ourselves. Donna Bell’s isn’t your mass marketing powerhouse: their website even warns you to call ahead if you’re planning to drop by, because they are known to close up shop early if they sell out of goodies for the day! This isn’t the kind of business you usually find in midtown Manhattan — but how refreshing it is! 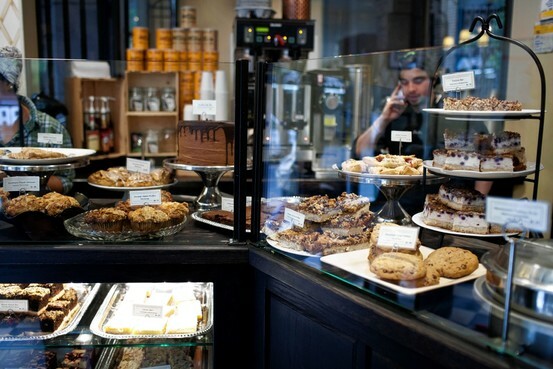 Donna Bell’s Bake Shop offers a little taste of the South for customers in Hell’s Kitchen. Southern food and hospitality will greet you at the door. The shop boasts scones, cakes, brownies, biscuits, muffins, puddings, cookies, and sandwiches that are out on display for you to take a look at before you buy. I simply had to try the chocolate chip cookies that stopped me in my tracks. I found them to be gooey and delicious — straight out of the oven, still warm and falling apart in my mouth. I wish I had a picture to accompany my description, but the treats my mom and I picked up didn’t even last long enough for me to take a quick snapshot of them. Hopefully these Google pics of the shop will tide you over until you can check everything out for yourself! You can find Donna Bell’s Bake Shop on 49th Street between 8th and 9th Ave. in New York City. If you’re not in the area, you can order sampler packs of their bestselling treats right here. Having had the peach muffin, I can attest to the fabulousness of these baked goods. If you’re in the area, stopping in is a must. you will not be disappointed. Next time I am in New York I will make a special point to visit Donna Bell’s…cup of coffee and brownie sounds good. Sampler package sounds interesting…. It’s definitely worth the trip, but the sample pack is a great way to try out a selection right from home!